Good morning! Anyone else thinking that Memorial Day weekend can’t come soon enough? 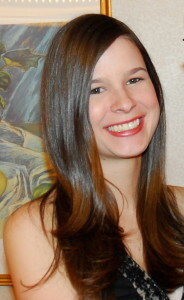 I realized that I haven’t been posting as much on exercise and running lately. Though it’s been an adjustment to exercise in the evenings and add it into my busy schedule, I’ve still been getting my sweat on at least 5 days a week. In terms of running, for the last couple of weeks I’ve been taking it a bit easier and not so much challenging myself to run farther. Most days, I’ve been sticking to running 3.1 miles on the treadmill. I usually try to increase my speed for the last couple of minutes, but other than that, I’m running at my normal pace (a little under 10 minute miles). 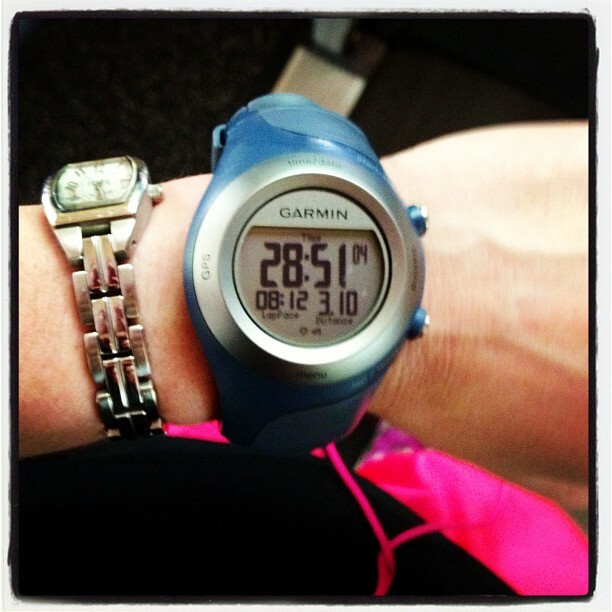 Right now, I’m happy running 3.1 miles (and it most definitely is still not easy for me!). Hopefully I’ll be up for more distance or speed soon! Since I don’t start cooking dinner until 7:30pm now, I’ve been trying to incorporate some quicker recipes into my weekly menus. 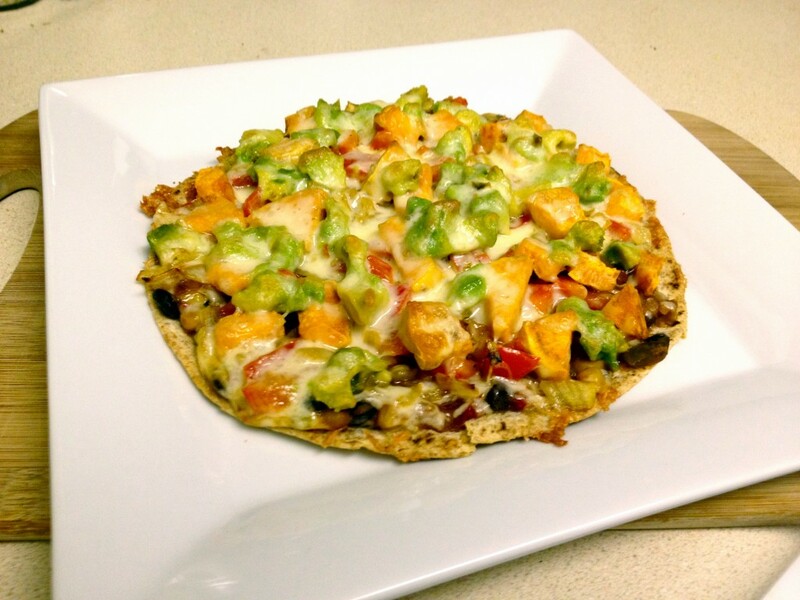 One recipe that I came up with last week will definitely be going into the books to be repeated: Mexican Tortilla Pizzas! I suppose you could also call them open faced quesadillas :). This recipe is incredibly delicious and so easy to throw together on a busy night. You may have caught on that I love using sweet potatoes in my Mexican dishes, and this one is no different. If you want the recipe to come together even more quickly, you can roast the sweet potatoes ahead of time so that they are ready to go, or you could just microwave the sweet potato and spread it on the tortilla before you add the salsa. First, peel and chop your sweet potato and roast it at 425 for about 20 minutes, flipping once. 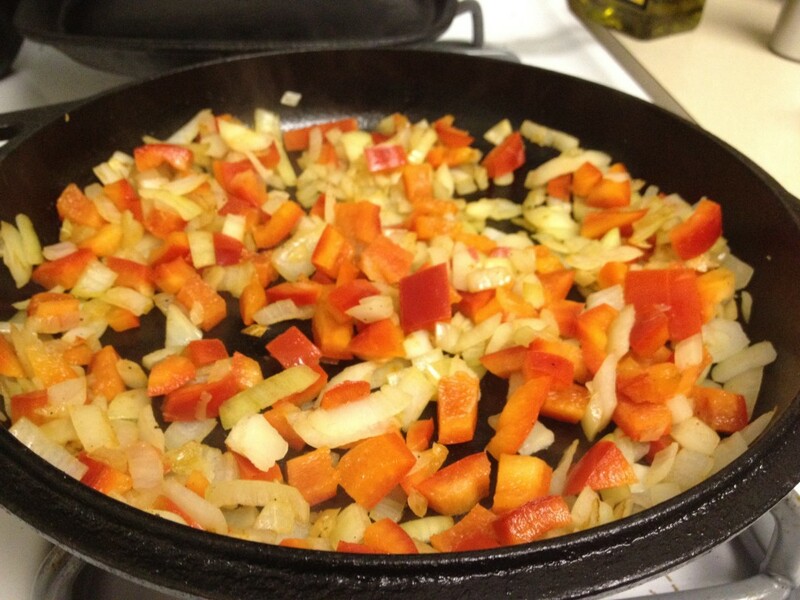 In the meantime, dice your onion and red pepper and sauté them in a skillet over medium heat for about 10 minutes. While the veggies are cooking, chop up the avocado and grate your cheese. Also heat up your tortillas over medium heat on another skillet. This is optional, but it helps give the tortillas a nice crisp. Then you’re ready to assemble! First, spread your favorite salsa over the tortillas to act as the sauce. Then add the onions and pepper, followed by the sweet potato and avocado. And don’t forget the cheese! Then place them in the oven and bake them at 425 for about 10 minutes, until the cheese is melted and the tortillas are crispy. Let them cool for a couple minutes and enjoy! Preheat your oven to 425. 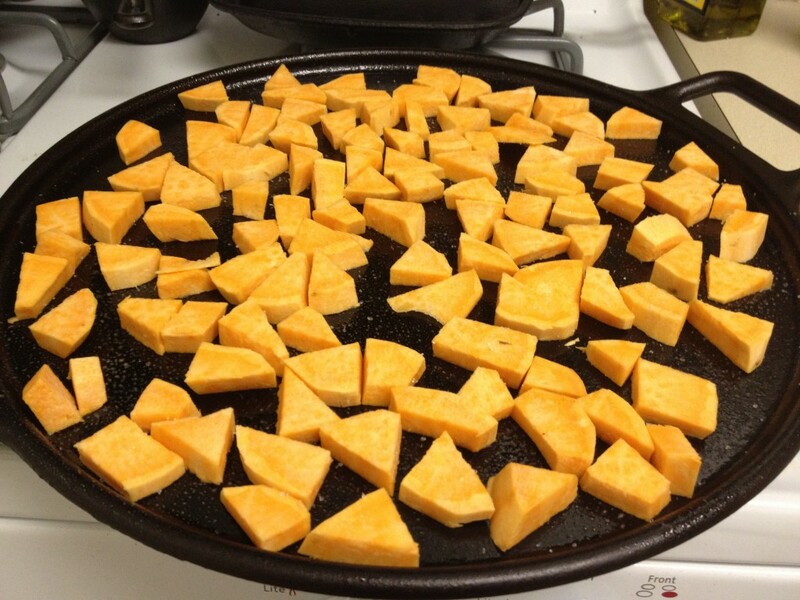 Peel and chop your sweet potato and bake it at 425 for about 20 minutes, flipping once. In the meantime, dice your onion and pepper. Sauté them in an oiled skillet over medium heat for about 10 minutes, until softened. 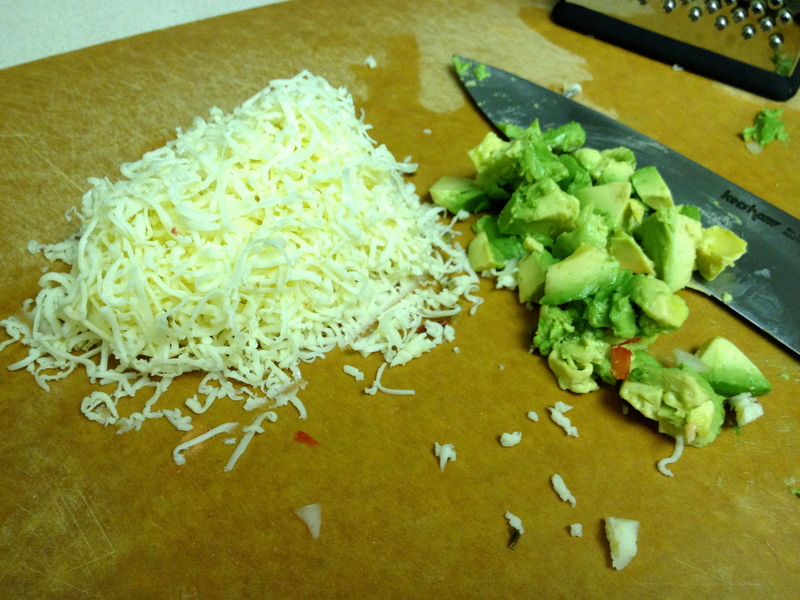 While the veggies are cooking, grate your cheese and chop up your avocado. 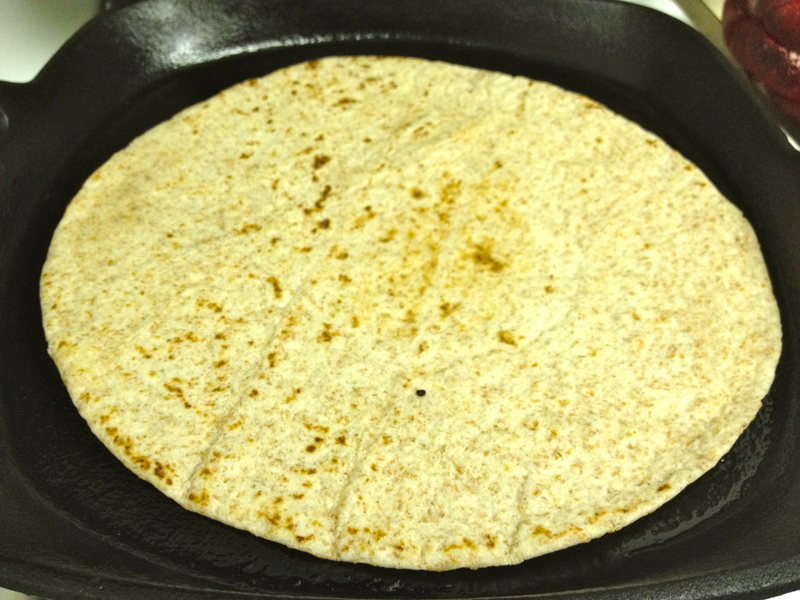 Also heat up the tortillas on an oiled skillet over medium heat, about 2 minutes on each side. This step is optional but it creates a nice and crispy tortilla for the crust! When the veggies are done cooking, begin assembling your pizzas. First, spread 1/2 cup of salsa on each tortilla. 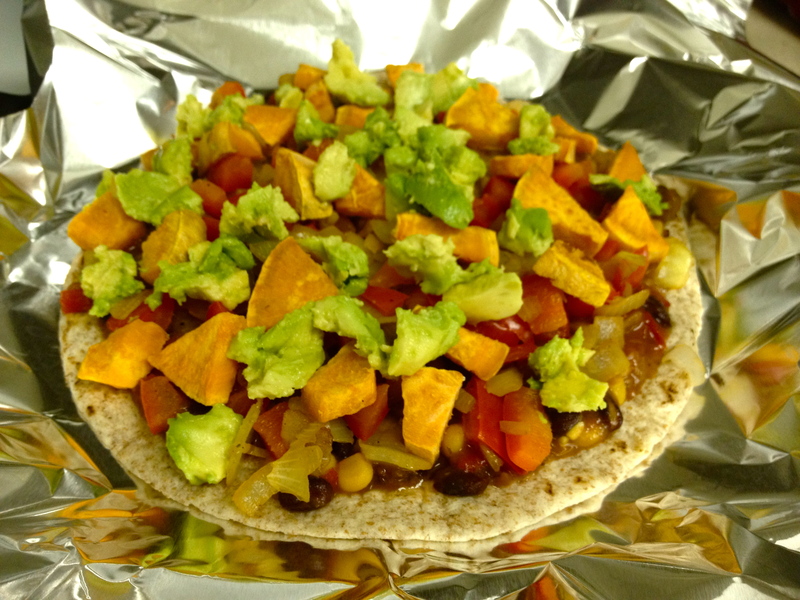 Then add the onions and peppers, followed by the sweet potato and avocado. 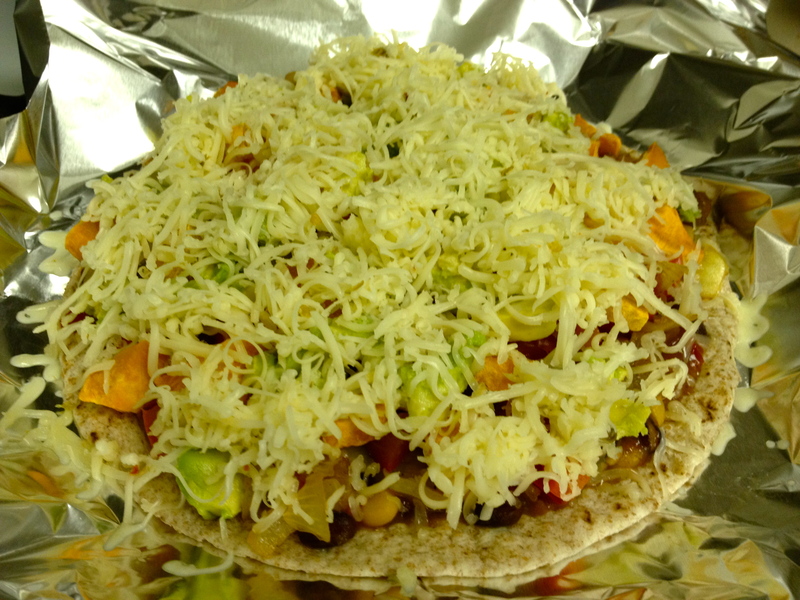 Finally, sprinkle the cheese on top. Bake at 425 for about 10 minutes, until the cheese is melted and the tortillas are crispy. 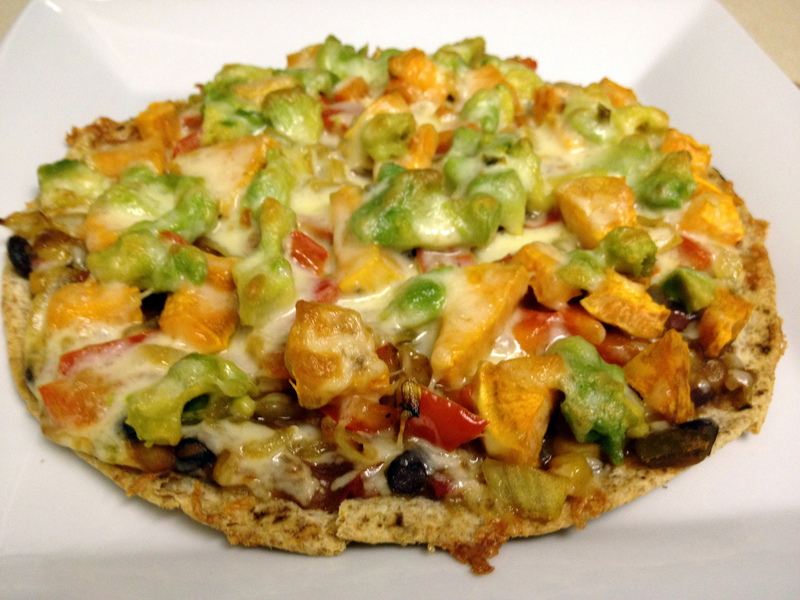 This entry was posted in Fitness, Gluten-free, Mexican, Recipes, Running, Vegetarian and tagged gluten-free, mexican, pizza, vegetarian. Bookmark the permalink. Wooohoo – fantastic run! I’m so not looking forward to four miles tonight…but I’m gonna have to get it done!